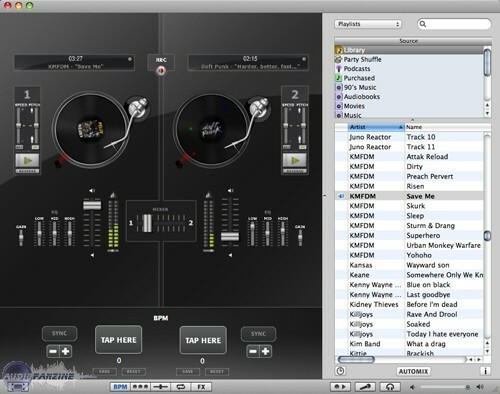 Djay, DJ Software from Algoriddim. 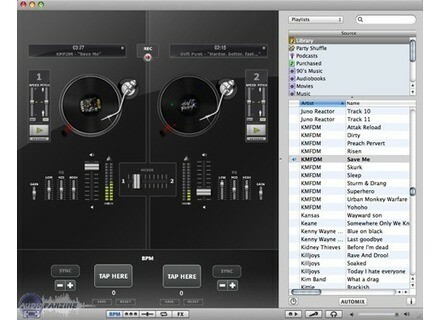 Algoriddim has announced the release of version 2.2 its music player and DJ software. djay 2.2 now lets users control almost all functions of its turntable-style user interface through intuitive Multi-Touch finger gestures on notebook trackpads, thereby significantly improving the user experience and, potentially, superseding expensive DJ equipment with a simple all-in-one notebook setup. djay supports a variety of trackpad gestures. Similar to using the iPod's click-wheel, users can use rotate gestures on the trackpad to quickly browse djay's built-in iTunes library and throw a selected song on one of the turntables with a swipe gesture. Two-finger gestures allow scratching MP3s on the virtual turntables, crossfading between songs and adjusting speed, volume and equalizer sliders just like with a real turntable and mixer setup. * Significantly improved two-finger and Multi-Touch trackpad support to control turntable, mixer, sliders and music library individually (Multi-Touch control applies to the user interface element currently focused by the mouse cursor). * Added Multi-Touch control to master volume, sampler, precueing and bonjour volume slider. * Added Multi-Touch control to open/close/switch tools. * Added rotate and swipe gesture control. * Added preference to enable/disable Multi-Touch control. * Added dialogue to confirm quit if sound is still playing. * Added option shortcut to load song on active turntable on double click. * Added double click and right mouse click on slider for reset. * Improved iTunes sorting behavior. * Automatically sort albums by track number. * Improved play/pause behavior with space bar. * Changing line faders does not affect pre-cueing channels. * Changing line faders preserves the audio signal metering. * Fixed iTunes marked/played column header highlight. * Fixed issue with Multi-Touch control for pre-cueing crossfader. * Fixed issue with 22 kHz sample rate audio files. * Fixed issue with some Vestax VCM-100 controllers being detected as VCI-100 (added option to select configuration). * Fixed issue with sampler LED buttons on VCI-100 MIDI Controller. djay is now available for $49.99 or €39.99 as an immediate download from the algoriddim website, or as a boxed product from the Apple Online Store and Apple Retail Stores worldwide. EKS OTUS Available The "next generation" DJ controller Otus is available for order at the EKS webshop.